If you’re a new Google Chrome user coming from Firefox or Internet Explorer, a habit you’re likely to have is to click the X button in the upper right corner and expect a notification asking you to confirm that all open tabs will be closed. Clicking the X button in the upper right corner many times makes you believe that you will be closing current opened tab if you have multiple tabs open — that why most browsers like Firefox and Internet Explorer ask for confirmation. Unfortunately, this is not a basic feature of Chrome — and it may get you frustrated when you accidentally close all your tabs. Luckily, Google has an extension that will make Google Chrome ask before closing multiple tabs. To make Chrome ask you before closing multiple tabs all you have to do is download Chrome Toolbox (by Google). 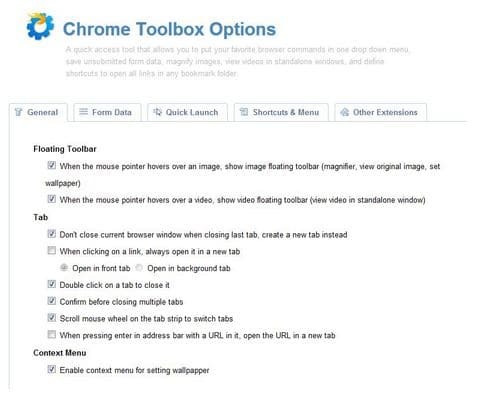 Chrome ToolBox brings may features to Chrome that other browsers already have like confirming before closing multiple tabs or not closing the browser when closing last tab. After you download the extension, you can navigate to its options by clicking the its icons in the browser at the right of the address bar. Another thing you can do is reopen pages you left the last time you closed the browser. To do this, go to Settings >Options > Reopen the pages that were open last.